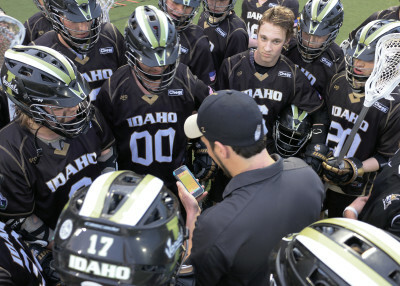 It’s not often true Hog lacrosse fans can root for another team — but the University of Idaho is an exception. 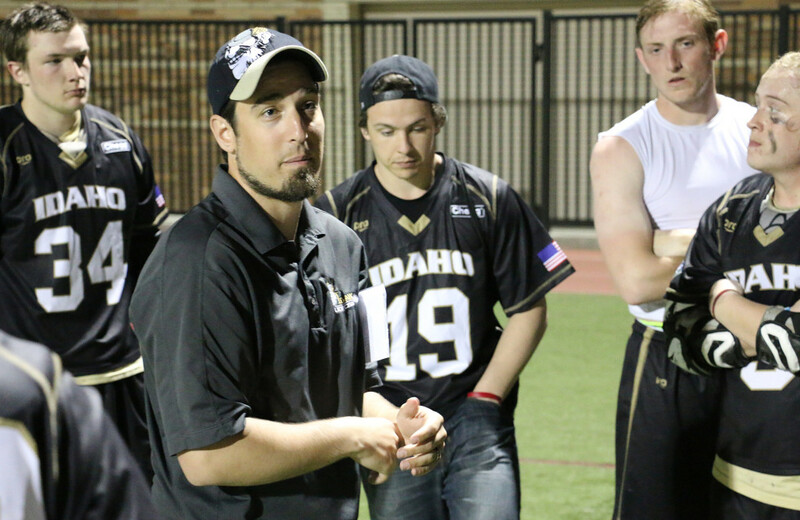 Vandals lacrosse head coach Sammy Seidenberg played goalie for Humboldt State University from 2006 to 2010 and graduated with a degree in film. HSU head coach Tony Silvaggio credits Seidenberg as being a catalyst for the program’s recent resurgence. 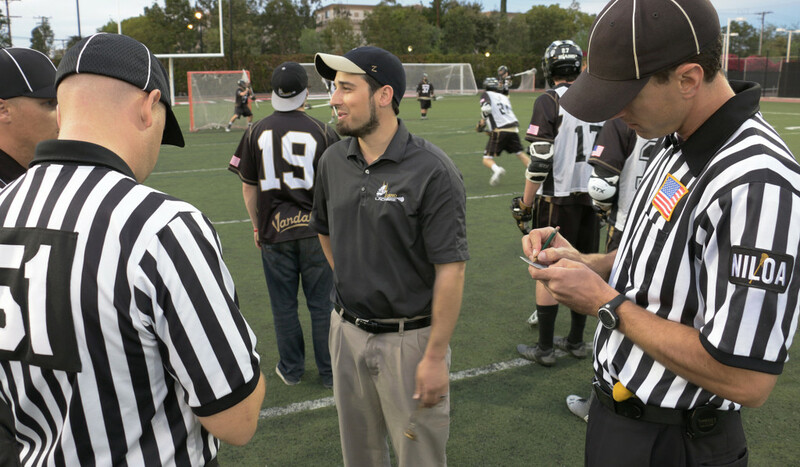 We caught up with the 26-year-old coach this Spring Break after a game against Chapman University in Orange County, California. We couldn’t help but notice that during Sammy’s pregame speech to the team, he spent part of the time not yelling out last-minute instructions but delivering punchlines. What’s up with the pregame joke? Last year, we were in Utah for Spring Break and we were struggling. We weren’t able to come out fast in games and the next game I was like ‘I gotta change it up,’ so we changed up the way we start games and then we decided to start telling jokes before the games. So I started doing that and they came out loose and having fun. It really helps them come out fast in games. I pick them. Me and my assistant coaches. Uh… I’m not really. But, you know, I try. (laughs) But they’re all written-down jokes, so I don’t make them up. How’s life in Big Sky country? Oh, it’s great. I love it up there. I was coaching a D3 school in Pittsburgh (Washington & Jefferson College) and that was a lot of fun — I enjoyed that — and the head coaching job at Idaho opened up. They really wanted to rebuild the program, so that was my focus: to recruit and get a lot of guys here, bring in some talent and really make it more of a serious program. And we’ve done a great job of that. The guys are really buying into everything, they love playing here and I love it up there. It’s a great school, great country. It’s a lot of fun. What would you tell someone if they were thinking of going to HSU? All my players are like ‘(Chapman Field) is a beautiful stadium.’ Humboldt has the most… the Redwood Bowl is probably one of the coolest places that I’ve ever played in. We played Dominican there my junior year and we put on a game because we were just loving playing there. And I know they got the new field, the new field is great. It’s a great school, great atmosphere. Tony’s a great coach. He does a good job. 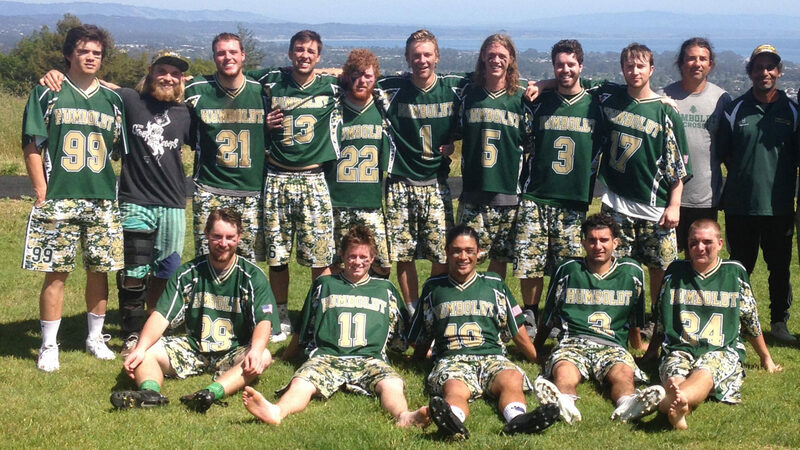 I think really, if Humboldt guys start recruiting a little bit more, that team can do something. With the area that you have, and the people you pull, if you can get guys motivated — kinda like what I’ve had to do here — you can really get some good talent. So then you’re rooting for the Hogs when you play HSU? I gotta root for Idaho, but I always have a little place in my heart for Humboldt. They gave me my roots. I helped re-start the women’s program there. If I didn’t take that coaching job, I wouldn’t be a coach now so I owe everything to them and I owe everything to Tony. He’s a great motivator, he’s a great coach. He really helped me find my path in college so I definitely appreciate that. How’d you end up in Humboldt and on the team? I was looking to play hockey in college, actually, and lacrosse. I had a couple of opportunities to play hockey and they ended up falling through for me and Humboldt was my No. 1 school outside of that. And there was an opportunity to play a little hockey there and also some lacrosse. And I love playing and I went up there and my first year there was the first year we were trying to get back in the MCLA with Hale Soyster as the coach. We struggled; it was definitely a struggle. Sophomore year was better. Tony came in and really restarted the program and did a great job. My junior year was great. We had a great year, my junior year. We played hard. We almost won the Humboldt Tournament that they used to run every year. And we had a great couple of games in the spring as well, a couple wins. It was fun playing goalie there. I was a starter for three, four years there. It was a lot of fun, but there was definitely some tough games and low numbers. But it’s great to see — I’m always following Humboldt to see how they’re doing — and it’s great to see that they’re getting better and better every year. Hopefully we can keep it rolling. Wait — there’s hockey at HSU? I was playing a little semi-pro in the area. I was driving three hours to play hockey, at the Charles Schulz Ice Ring … in Santa Rosa? Ever get a chance to get back up there at all? Yeah, every once in a while. I was back up there a couple of years ago. I haven’t been in a while but I’d like to go. I’d like to try, you know, to get out to a game that we’re not playing against them as well. And I’d love to go back there some day at some point. I think that’s a school that could really go somewhere as a program, maybe go D2, D3, something like that. Any truth to the rumors that you came back to southern California just for the In-N-Out Burger and carne asada? Oh you know it… we got some Cali kids on the team but we haven’t even had In-N-Out yet, which is surprising. We gotta get it. But the guys are loving it. This is a great opportunity for us to play — we’re playing two Top 25 teams — and it’s a good opportunity for us to play talent that we usually don’t play. And we have a great conference but we’re not playing teams like Chapman. That’s huge for us. That just gave us a lot of confidence, a lot of motivation moving into our big conference games coming up. We’re looking to take down Oregon that weekend for the first time ever. We did it in the fall so we know we can do it in the spring. What’s lacrosse mean to you? It’s my life. This is what I want to do for a living, is be a coach. I want to be a coach for the rest of my life, a lacrosse coach. I love it. I love motivating guys. I love playing. There’s nothing better than a night like this, honestly. But I love this sport, I love the game and I couldn’t be happier doing what I’m doing. It’s the best job in the world. Anything you want to share about Humboldt and your times up there? I think the biggest thing is, if guys can start really taking it seriously, taking it to heart, they can do something special there and win a conference championship, they so could. … People who are looking to go there, if you want someone to talk to about going there, talk to me. I’ll convince you. It’s a great place. I loved it. I wouldn’t change anything.